Dodging and burning are techniques that were once used extensively in the photographic darkroom to improve the appearance of photographs, sometimes quite dramatically. The term Dodging refers to lightening an area of the image whilst Burning is darkening. These techniques have now made their way through to image editing tools such as Photoshop, which even includes a dodge and burn brush. Unfortunately the Photoshop dodge and burn brushes are what we call destructive in that they work on the image directly and therefore can’t be adjusted or removed later. This tutorial will introduce you to an alternative approach to dodging and burning that is non-destructive. Open the image you want to dodge and burn in Photoshop. Add a new layer by selecting “Layer | New | Layer…” from the menu. This will cause the New layer dialog box to be displayed. Call this new layer “Dodge” and in the “Mode:” drop down list select “Overlay”. When you do this the checkbox directly below the Mode drop down will become enabled and should be selected. You can see an example below. You can now click the “OK” button to create a new layer which will be filled with grey. You should see the new layer added to the Layers window similar to the screen shot shown below. You can now duplicate the Dodge layer by clicking on it and pressing Ctrl + J on the keyboard (Command + J on a Mac). 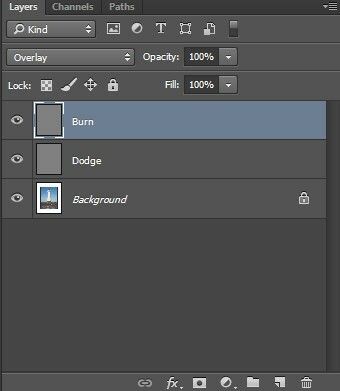 When the new layer appears in the Layers Window rename this to "Burn". You can see an example below. Now select the paintbrush tool and set the colour to white. It’s also helpful to set the brush to have a soft edge and the opacity to about 12%. These settings help you to blend the adjustment you will make. You can see some typical settings in the following screen shot. 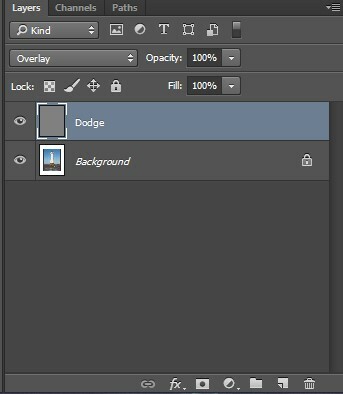 Now select the Dodge layer by clicking on it. Once selected you can start to paint on the image in the areas that you would like to lighten. As you paint you should notice these areas become lighter with each brush stroke. If you find a single brush stoke is making the image too light, reduce the brush opacity. It’s quite helpful to use a low opacity and then build up the effect with multiple brush strokes. Once you have lightened all the areas you want to switch the colour to black. You can now paint onto the Burn layer in the areas that you want to darken. 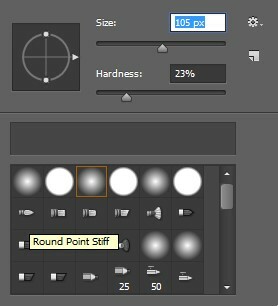 If you find the effect is too strong you can adjust the opacity setting of the layer to control this. Take a moment to experiment with other blending modes. Overlay offers a good starting point but don’t overlook modes such as Soft Light. If you find you can see the brush strokes despite using a soft edge brush you can apply a blur to the layer. This can help soften the edges even further and blend the effect.